I’ve uploaded an image at OpenNebula’s marketplace with the latest VyOS 64 bits stable version called Helium for KVM. If you need help or have questions please send me your comment or contact me through my personal website. Soon I’ll published a post in OpenNebula’s blog about VyOS. I’ve just published a new appliance. This is my second appliance for the marketplace and this time I’ve created an image for VyOS, the community fork of Vyatta. Vyatta was acquired by Brocade two years ago and no new Vyatta Core images were released. That’s why I’m delivering this image for KVM in case you need a Vyatta based virtual router for your cloud. The image is available in the marketplace and it’s already loaded with a contextualization script that will, hopefully, configure the network interfaces with an IP address and add ssh public key for the vyos user. The user is vyos and the password is also vyos. More instructions are include in the marketplace. If you want to host this image so the download time is quicker please let me know. Also if you need my help or find a problem with the image don’t hesitate to contact me. Set a Default Gateway: set system gateway-address x.x.x.x where x.x.x.x is an IPv4 address. 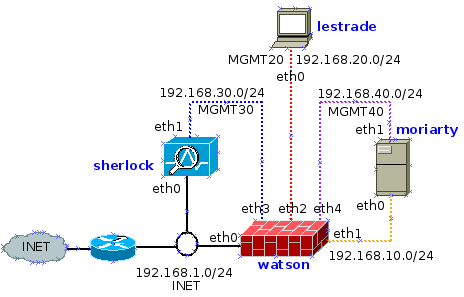 My lab has started with a basic configuration where I’m not using VLAN (but I will…) so I’ve configured several interfaces in my Vyatta Core router. I want my virtual machines to be able to get packets from Internet but unfortunately the router which connects me to Internet has no way to add routes so it doesn’t know how to deal with packages from the networks behind my router. OK, thanks to this masquerade NAT, my virtual machine can download packages from Internet. Important: this translation won’t allow these virtual machines to be reachable from Internet. I’m very happy to announce that today I’ve uploaded my first appliance to OpenNebula’s Marketplace. For my first appliance I’ve choosen Vyatta Core’s virtual router/firewall. It was difficult to make the contextualization work but it helped me to learn more about OpenNebula and Vyatta. Please leave your comments or contact me if you find any problem with this image. I’d also like to thank C12G for Marketplace and my friend Jose David for hosting the image. I hope this image works for you and that you find it useful. These days I’m reading Vyatta Core’s documentations as I’m planning to deploy virtual routers and firewalls on my OpenNebula cloud laboratory. I remember the days I worked with Cisco routers and how many times I had to use a tftp server to store configurations. You don’t need a tftp to store remotely your virtual router configurations (you can use ssh or ftp) but I feel nostalgic and I want to use that server in my CentOS machine. Your TFTPD server will be running in the UDP 69 port.